The Sisters of Mercy, originally founded by Catherine McAuley in Dublin, Ireland in 1831, vowed to serve people who suffer from poverty, sickness, and lack of education. In 1854, under the guardianship of Sister Mary Baptist Russell, eight Sisters of Mercy made their way from Ireland to San Francisco, and immediately began caring for residents of a city struck by cholera, typhoid, and influenza. 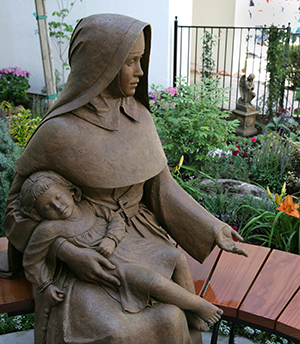 Sister Mary Baptist Russell, a well-educated daughter of a middle-class Irish family, is recognized as the California foundress of the Sisters of Mercy. Sister Mary Baptist and the other seven sisters founded St. Mary’s Hospital in San Francisco, now the oldest continuously operating hospital in the city. The sisters made their way to Yreka in 1871 then to Red Bluff, where they opened the Academy of Our Lady of Mercy on March 3, 1882. Twenty-five years later, they accepted a donation from Elizabeth Kraft to operate what became known as St. Elizabeth Community Hospital. In the late 1940s, the Sisters of Mercy assumed responsibility for St. Caroline’s Hospital, now known as Mercy Medical Center Redding, and in 1986, they acquired the hospital in Mt. Shasta and renamed it Mercy Medical Center Mount Shasta. Today, Mercy Medical Center Redding, St. Elizabeth Community Hospital, Mercy Medical Center Mount Shasta, Dignity Health Connected Living, and Mercy Foundation North are all sponsored by the Sisters of Mercy. These ministries are under the umbrella of Dignity Health, the fifth largest health system in the nation with more than 40 hospitals across three states – 22 of which are Catholic-based facilities. The mission and values we were founded upon remain the same. Through teamwork and innovation, faith and compassion, advocacy and action, we endeavor every day to keep our patients and those we serve happy, healthy, and whole. For over two decades, Mercy Foundation North has been partnering with the community to raise philanthropic support to enhance the lives of people in the North State area. During this time, Mercy Foundation North supporters have contributed more than $67 million in charitable gifts. Through the generosity of our donors, the Sisters are able to care for those most in need.